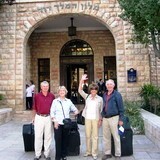 Explore Israel & the Holy Land with Zack Shavin as your private tour guide! Veteran guide, biblical archaeologist, & wilderness instructor, Zack specializes in tailor-made tours: Jewish, Christian, biblical archaeology, desert safaris, & nature. 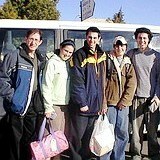 Whether making a Jewish Heritage tour, Christian pilgrimage, cultural visit, or business trip, Zack Shavin’s private car tours are the ideal way to go for in-depth touring, personal service, comfort, convenience, and time efficiency. Zack not only guides your party, but offers free program development, suggests hotels for every budget, and provides private transport for any size party. 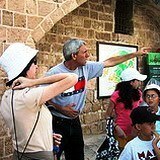 Zack Shavin, as both your personal tour planner & Tour Guide, and with over 35 years of experience, offers total flexibility in planning your Israel / Holy Land tour. Zack’s commentary and the sightseeing program is tailored to your particular interests, background, special needs, and age of kids. Walkers and wheelchairs are available upon request. It’s your own private Israel tour, so we’re flexible: Stop for that great photo-op, get a cold drink or some ice cream when the kids get fidgety, spend more or less time at a given site depending on interest, and no unnecessary waiting for others. And if there is something you want to stop and see while we’re on the way to our planned sightseeing destinations – no problem! Good, clean, and pleasant accommodations are very important. Zack Shavin has hand-picked a wide variety of hotels, guest houses, and kibbutz lodges that offer comfort and good service in a relaxed atmosphere. Once your touring program is set, Zack can also help you choose and reserve hotel accommodations that are conveniently situated along our touring route. 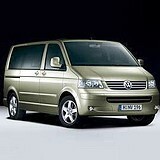 Zack Shavin offers a variety of touring vehicles depending on the size of your party or group: 7 passenger minivans, 12 passenger full vans, 19 passenger minibuses, 35 passenger Midi’s, and 55 private motor coaches. 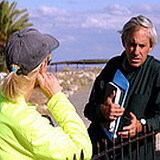 For more information about Zack Shavin’s Private Guide Israel & Holy Land Tours please contact Zack, veteran guide & biblical archaeologist at Land of Israel Tours. For recommendations see Testimonials and Clergy Feedback. You can also read About Zack and see Trip Advisor.